Occasionally windy with some warm days in fortnight and short-duration thundery showers on 4-6 days. In addition, expect periods of showers, heavy at times on 1 or 2 days in 1st week, and passing showers on a few days in the latter half of fortnight. Singapore, 16 January 2019 – The prevailing Northeast Monsoon season is forecast to continue for the rest of January 2019. In the second half of the month, the low level winds are forecast to blow from the north or northeast. 2 In the second fortnight of January 2019, occasionally windy conditions can be expected on most days during the period. In addition, solar heating of land areas could give rise to short-duration thundery showers, mostly in the afternoon on four to six days. On one or two days in the first week of the fortnight, a monsoon surge over the South China Sea is expected to bring periods of showers over Singapore and the surrounding region. In the latter half of the fortnight, the monsoon rain band currently located just north of the Equator is forecast to shift south, over the Java Sea region. With most of the convective activity expected over areas south of the Equator, Singapore can expect passing showers, mostly during the daytime on a few days. Overall, the rainfall for January 2019 is likely to be well below-normal. 3 On most days in the second half of January 2019, the daily temperatures are forecast to range between 24°C and 33°C. Warmer daily maximum temperatures of around 34oC can be expected on days when there is little or no rainfall. 5 Northeast Monsoon conditions prevailed over Singapore and the surrounding region in the first half of January 2019. On most days during this period, the low level winds were blowing from the northeast or northwest. 6 On several days in the first week of the fortnight, it was dry and occasionally windy over Singapore and the low level northeast or northwest winds shifted to blow from the west. These conditions were due to the presence of Tropical Storm “Pabuk” over the northern part of the South China Sea which eventually weakened after it made landfall over southern Thailand on 4 January 2019. In the second week of 2019, it was generally wet as thundery showers fell over the island in the afternoon on most days of the week. The highest daily total rainfall of 71.8 mm was recorded on 12 January 2019 at Upper Thomson, when heavy thundery showers fell over the western half of the island between the late afternoon and evening. 7 The unseasonal warm conditions in the later part of December 2018 continued into the first fortnight of January 2019, where several warm days were experienced. The two highest daily maximum temperatures recorded in the fortnight were 34.8oC at Choa Chu Kang on 12 January 2019, and 34.5oC at Marina South on New Year’s Day respectively. In the first half of January 2019, the daily maximum temperature ranged between 32.5oC and 34.8oC, and the daily minimum temperature ranged between 23.1oC and 25.2oC. 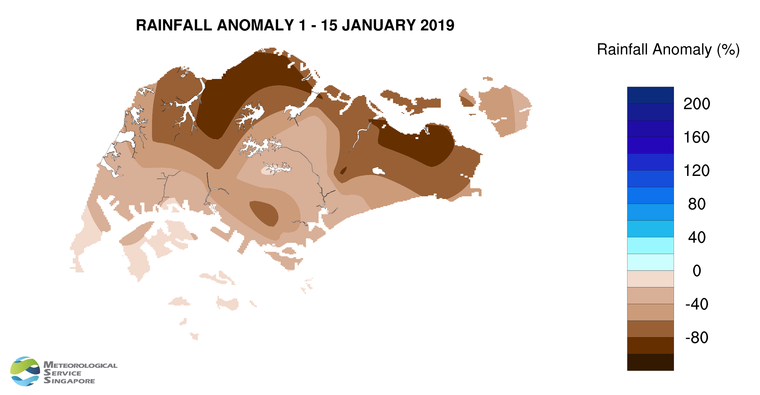 8 Singapore received well below normal rainfall in the first fortnight of January 2019. The highest rainfall of 90.8 mm (15% below average) was recorded at Upper Thomson. Rainfall was lowest at Changi where 6.4 mm (95% below average) was recorded.